This month, our day programmers showed us how to design a block using an art print. Participants had fun creating colorful paper models and everyone is looking forward to seeing the fabric version of those blocks at our next meeting. In the evening meeting, guest Claire Haillot gave an in-depth introduction to Electric Quilt 8 (EQ8). 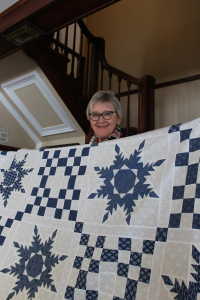 Claire is an experienced quilter and speaker, and has been using Electric Quilt for years. 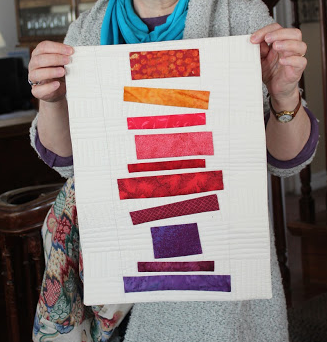 She demonstrated how this powerful quilt design program can put your computer to work for you, speed up the design process and save more time for sewing. She finished up by showing some of her quilts. 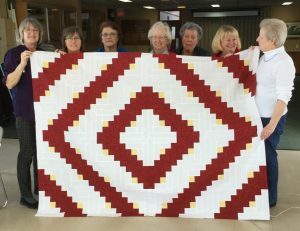 If you would like to learn more about EQ8 Laura MacDonald has a few classes at Quilt Canada In Ottawa from June 12-15. The day meeting this month featured a guild development grant recipient. Lucie talked about the highlights of Ricky Tims’ Quilt Luminarium which took place in Burlington, last May. She showed a few of Ricky’s tips and techniques, some of his quilts, and shared some of his anecdotes. A few lucky winners left with samples of Ricky’s fabrics. The evening meeting was treated to a technology tour of sorts: highlights and demonstrations of all sorts of websites and tools available online, from pinterest to Bluprint (formerly Craftsy) and Spoonflower along with several others. The Resources page in the Members section has been updated to reflect the new sites and links that were shared. There was a draw again this month for those who entered the ‘website tour’ quiz. This month’s lucky winners were Roxanne Savard (non-slip quilting mat) and Pat Bradley (stack of neutral fat quarters). Congratulations ladies! 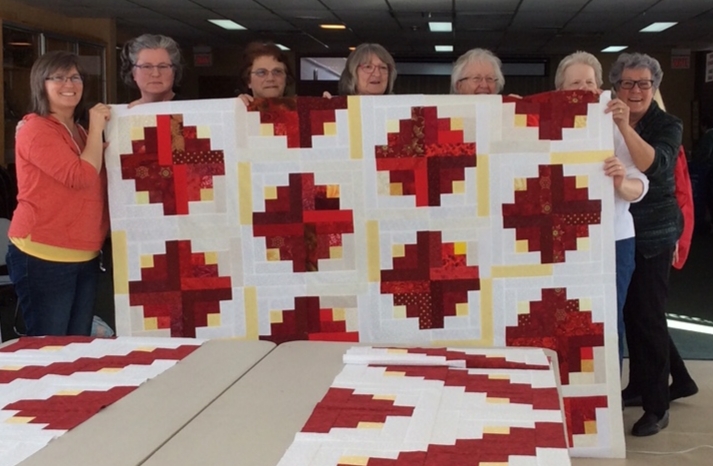 On Saturday February 16th, sixteen quilters came to spend the day at the annex for a Quilts of Valour sew-in. We completed two quilt tops and four quilters are working on a quilt of their own. There was one more quilt top done with the 9-patch blocks left from last year’s sew-in. So, we should expect a total of at least 7 quilt tops for our veterans. Great job ladies! 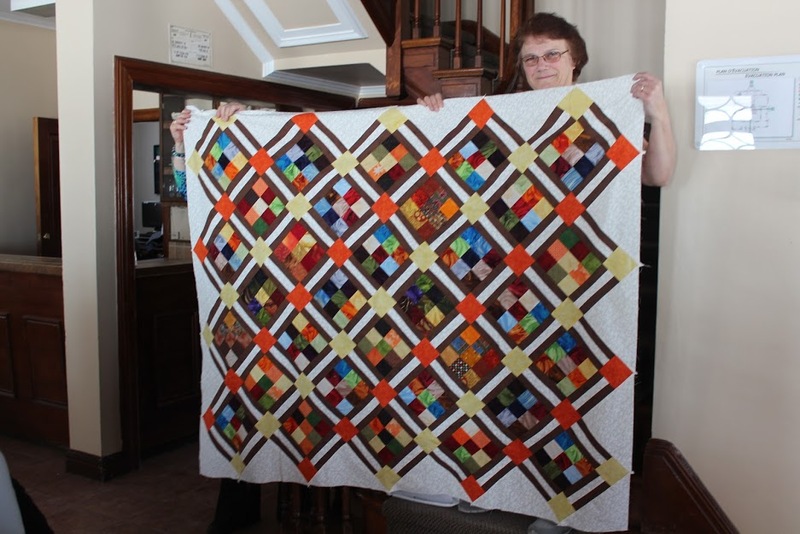 Dianne Robinson shares a striking two-tone quilt. Terrie Vorsteher explains one of the Mystery quilt clues. 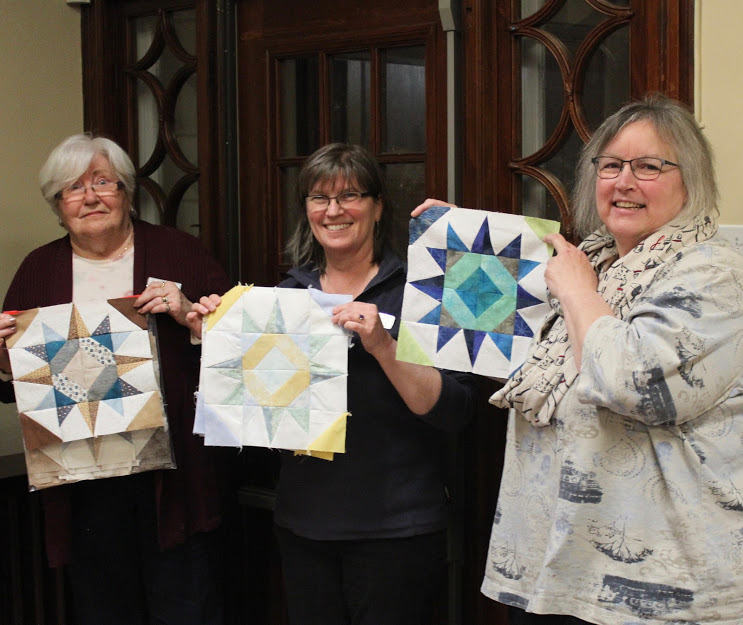 Bright graphic quilts for Quilts of Valour: fantastic work ladies! 32 people attended this retreat in a lovely setting by the river yet conveniently close to home! Things got underway Friday afternoon and needles, cutters, irons, design boards and other quilting accessories were put to good use until lunchtime Sunday. As always with this group, snacks were abundant and tasty: there was something akin to a ‘competition’ between the 2 sewing spaces as to which room had the best “snack-to-quilter” ratio! In addition to the snacks, we celebrated everyone’s birthday with a cake on Saturday night. The head housekeeper who has taken such good care of us all these years will be retiring at the end of March, so we presented her with a quilt; it was greatly appreciated. 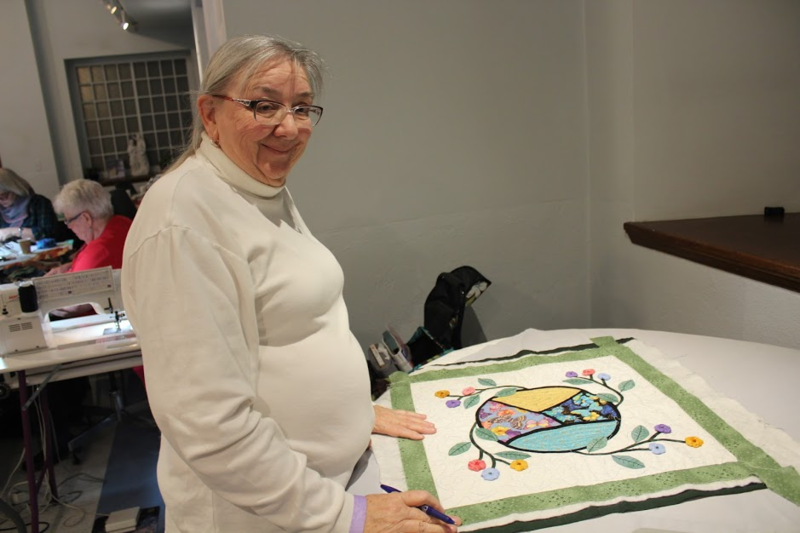 Attending a retreat, if you have never done so, is like being present at your own small group quilt show, with the bonus that you get to see the progress along the way….a great inspiration. 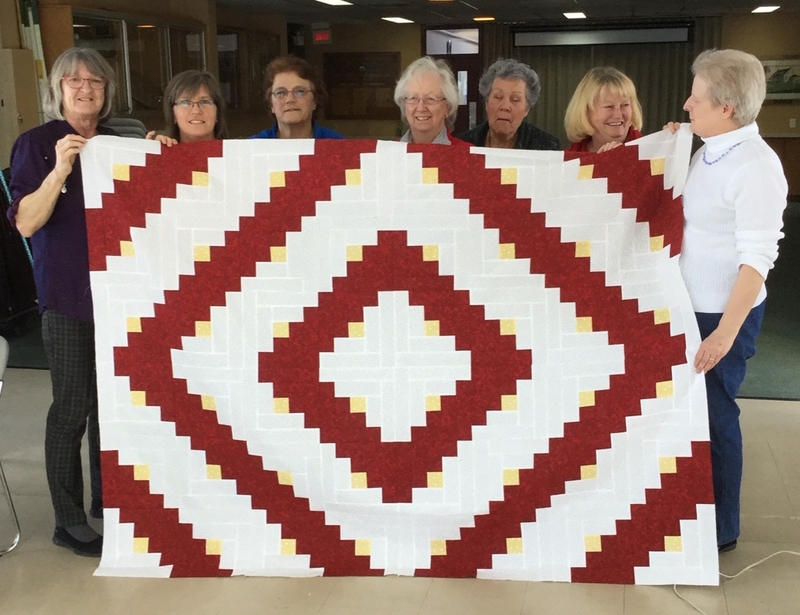 It was a great way to be productive and social, get to know fellow guild members better and learn from others about machine troubleshooting or piecing techniques, and to brainstorm quilting ideas and fabric choices. Mary MacMillan makes progress on a lovely project while Franca Redivo discusses her fabric choice with Nicole Brisse while Cathy Bonneville looks on. BQG’s development grant recipient Louise Charlton gave a very thorough recap of a course she took with Kimberly Einmo. Her quilts are eye catching and easy to do. Louise’s slide presentation was well done and she certainly spoke highly of Kimberly as a teacher. The regular January day guild meeting was followed by Outreach’s monthly sew-in day. 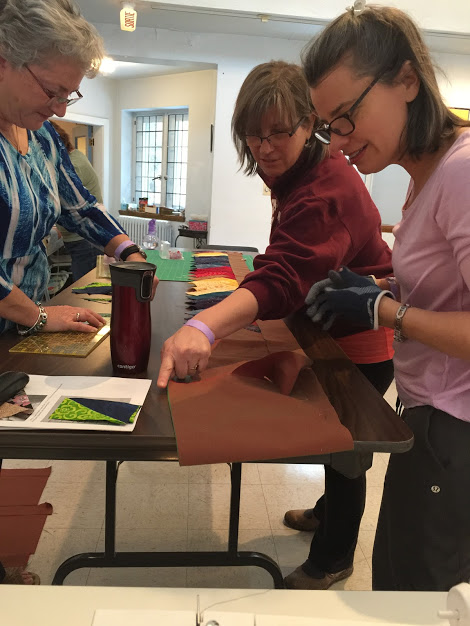 A production line was set up : four boxes of our fabric stash were brought in, along with Dawn Baxter’s Accu-Quilt machine for quick cutting of the ever-popular tumbler shape. Several new quilt patterns using this shape were also available, sparking creativity and conversation. Dawn’s machine did yeoman service, cutting some 500 tumbler pieces. We had intended to prepare kits, but something happened : no sooner were the shapes cut than willing hands whisked them away to sew them together, and people waited in line to have their tumblers cut in their choice of fabric. Good-natured trading of pieces in a wide variety of colours and fabrics went on for several hours – the more shapes cut, the more they were shared. Youpee ! 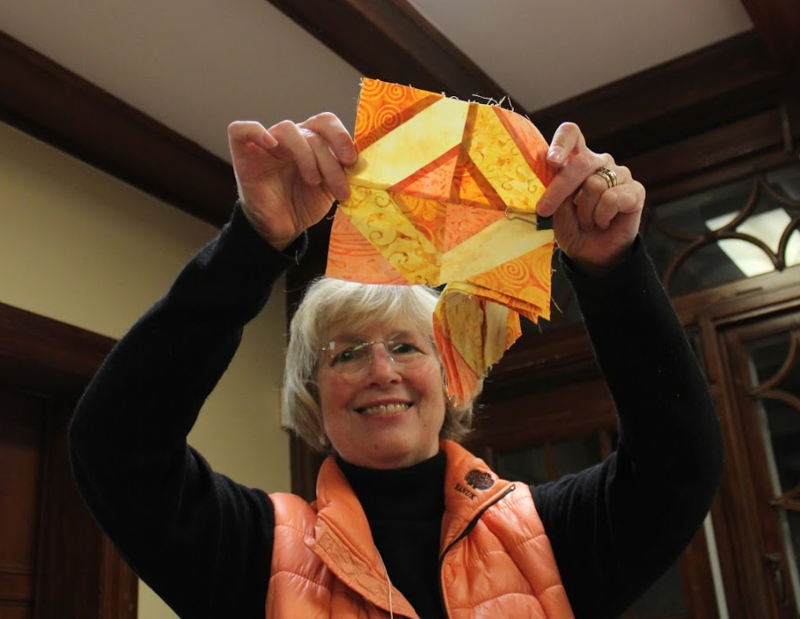 Outreach is already planning another session like this one – Roz Agulnik has an Accu-quilt machine as well and she has an excellent collection of cool dies with new shapes for us to try. And the bonus ? Our fabric stash has shrunk a bit, some dogs and cats will enjoy new beds filled with cotton scraps, new quilts in easy designs will be made for Outreach, and good fun was had by all ! “Show & tell” was a hit, as always, at both meetings… In the photos below, Caitlyn and Sonya show off their mystery quilt progress and Annette shares a quilt she gave her mom for Christmas.